No matches were played in the main draw as the Miami Open was completely wiped out due to rain, with Indian Wells Open champion Bianca Andreescu set to headline Wednesday's schedule. 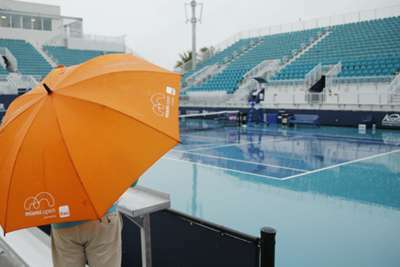 Inclement weather wreaked havoc in Miami, where the WTA Premier Mandatory event schedule was suspended and eventually washed out on Tuesday. The likes of Monica Puig, Samantha Stosur, Kristina Mladenovic and Andrea Petkovic were all due to play, but the quartet will get their campaigns underway a day later instead..
Fresh from winning her maiden WTA title last week, Canadian sensation Andreescu will face Irina-Camelia Begu, while three-time champion Victoria Azarenka takes on Dominika Cibulkova. Play has been canceled for the day at the @MiamiOpen due to rain ().